I lead a very active life, but that doesn’t mean I’ve been injury free these past sixty years. Seeing Dr. Bartucci when I separated my elbow and later Dr. Koutsky when my back began giving me problems enabled me to heal quicker and return to the work and activities I enjoy. Every visit I’m greeted by friendly staff in a relaxing state of the art facility. All of my family, friends and colleagues now see the team at Elmhurst Orthopaedics – and you should too! For top diagnosis and treatment of your joint and pain disorders, come to Elmhurst Orthopaedics, the home of Chicago’s leading integrated orthopaedic care center. 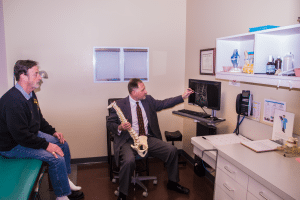 We offer a comprehensive orthopaedic diagnostic, clinical, and surgical care under one roof. From neck and spine disorders, to total joint replacement, shoulders, elbows, hand/wrist/arm, hip, knee, foot and ankle, Elmhurst Orthopaedics’ team of orthopaedic surgeons, pain management specialists, radiologists, and physical therapists will accurately diagnosis, clinically or surgical treat your joint or pain disorder, and coordinate your full rehabilitation to better health. We even provide second opinions! Call at 630.834.0491 and make an appointment today.